This fall, as I’m preparing for the first residency at Queens, I’m lucky enough to see two of my stories published. First, “Asylum” appears in Connotation Press which you can find by clicking the link. This was my first real attempt at “literary fiction,” so I’m glad that it can find an audience. The story involves a groundskeeper in an elephant sanctuary. 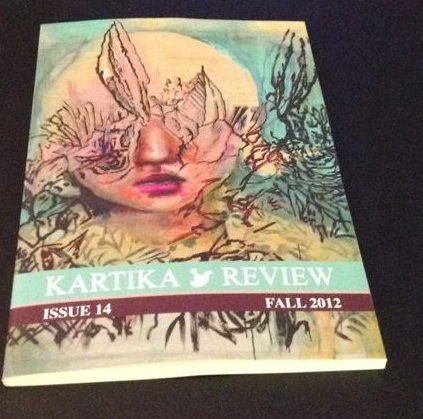 Next is “The Golden Turtle God” which appears in the Fall 2012 issue of The Kartika Review. You can read it online at the link, or even buy it in print! I have to say it’s a little surreal to see my name and my words in print. A beautiful feeling, really. Hopefully, there’s a lot more of that to come. The downside is that, with three publications, a good chunk of the work I’ve prepared for my Queens residency can be shelved (at least until later). I really only have enough work for this first semester, which means the writing process is going to be hell soon. This entry was posted in Asian-American Identity and Diaspora, MFA, Publishing, Writing and tagged connotation press, fiction, hoan kiem lake, kartika review, literary journal, mfa, publications, queens university of charlotte, short story, writer, writing on November 21, 2012 by antranwritesstuff. It’s become fashionable these days to say that the writer writes because he is not whole, he has a wound, he writes to heal it, but who cares if the writer is not whole, of course the writer is not whole, or even particularly well. There is something unwholesome and destructive about the entire writing process. […] Why am I so isolate in this strange place? Why is my sweat being sold as elixir? And how have I become so enmeshed with works, mere works, phantoms? A writer starts out, I think, wanting to be a transfiguring agent, and ends up usually just making contact, contact with other human beings. This, unsurprisingly, is not enough. Nothing the writer can do is ever enough. Are you one of those artists who has trouble with the idea that you might actually be ordinary? Because, no, no… I don’t mean that as a bad thing. I mean that most of humanity — and I asked you this last time — humanity is what we think of as common or ordinary. I think artists are sometimes trapped by their need to be extraordinary. And they distance themselves sometimes from other people. There’s a point when you’re with somebody in a relationship where the decision comes down to their love or your mask. And by “the mask,” we mean your terror in exposing yourself, your terror in making yourself vulnerable to this other person. […] Being in love means you actually have to be in the game. And to be in the game means that you have to actually risk losing, right? It’s not a game if you can’t lose. It’s something else. Writing, I think, is the act of opening yourself up to the entire world, exposing your vulnerability with the hope and the trust of being accepted, being loved and adored. I’ve heard many times that writing is “an act of love,” and I believe this is what is meant by that. It is not an act of love by virtue of the love of writing — the act of pen to paper (or fingers to keyboard) — but rather the sacrificial, frightening and vulnerable part of love and relationships. It’s the exposure, the terrifying degree of trust that is requisite for that sort of transparency. The unfortunate consequence is the isolation it requires, the walls that we have — intentionally or otherwise — built up around ourselves. Writing is a struggle. Rejections, at first, are as heartbreaking as failed relationships. You spend a few months in this optimistic dreamland, you imagine a future with yourself and this beautiful, amazing, prestigious journal … and then you’re told it’s just not going to work out. It could be for any reason, but most often, you’re just told that you’re not what they’re [she’s] looking for. You have good qualities, you’re a great person, but the chemistry isn’t there. You lack electricity between you. Rejection makes you heart-sore, a little angry, can spiral you into endless cycles of self-pity and shame and the constant thought of not being good enough. And maybe that’s why writing is so lonely. In many ways, it is like being perpetually single. As soon as you do get accepted somewhere, you celebrate for a bit, and then it’s back to the grind. That lonely soul-crushing grind. You go on and on and on, because what writing means is a life where you are constantly and relentlessly in pursuit of love. This entry was posted in Writing on November 4, 2012 by antranwritesstuff.